But that’s what a recent NBC News report set out to confirm. The report acknowledges in the second paragraph that the answer is “neither of them is healthy, what the hell were you expecting,” but hey, NBC News goes for it anyway. Let’s assume that once one has finished one’s giant beer and one’s plastic baseball helmet filled with super nachos, one will stop to consider which of two delicious but not healthy options is the healthiest. Which is the winner? Ultimately, the report makes the argument that pretty much anything is okay in moderation—something that’s both an incredibly obvious statement and a handy reminder—but not before informing readers that hey, by the way, processed meats are a carcinogen, and that eating red meat has been tied to conditions like diabetes and heart disease. 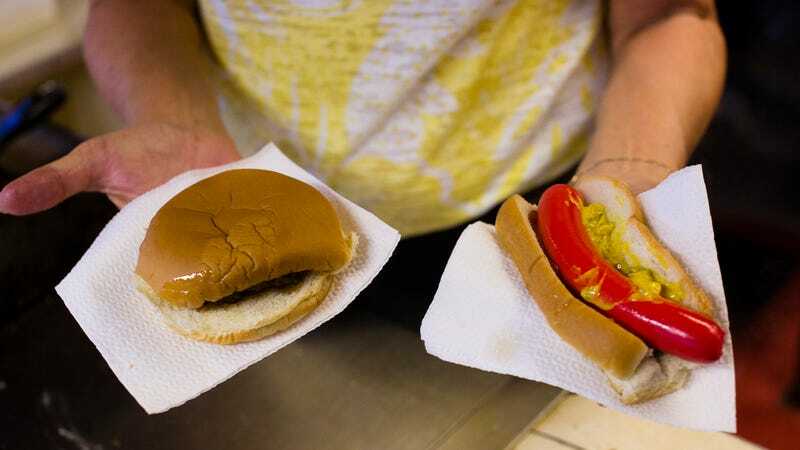 To be fair, the piece also offers some helpful suggestions on how to make these dishes healthier—skip the bun, watch the sides, and so on—but ordering a stadium hot dog sans bun seems like an exercise in disappointment. Ultimately, NBC calls this fight in favor of the hamburger, and rightly so. The piece notes that while franks might have a lower calorie count (assuming your dog isn’t drowning in chili and cheese, that is), hamburgers are much richer in protein and contain significantly less sodium. As with the hot dog, there’s a toppings caveat, but presumably if you’re wondering which of these two items is better for you, you’re not also asking how many onion rings you can get away with stacking on top.